Thiruneelanakka Nayanar was born in a Brahmin family situated in Thiruchathamangai, one of the flourished lands in the Chola Dynasty. Thiruchathamangai is once of the sacred place where the temple of Lord Siva – Ayavandheeshwar with his consort Goddess Ubaya Pushpa Vilochani is located, the people in this village were Vedic scholars and true followers of Shaiva Siddhantha. Thiruneelanakka Nayanar was an ardent devotee of Lord Siva and a Vedic Scholar; he performs ritualistic worship of Lord Siva on daily basis. He and his dutiful wife receive the devotees of Lord with utmost respect and provide them with their basic needs. On the auspicious day of Thiruvathirai, Thiruneelanakka Nayar with his virtuous wife arrived at the temple of Lord Ayavanthishwarar and the couple prostrated before the Lord. The devoted couple meticulously arranged all the offerings before the Lord and Nayanar immersed in the worship of Lord. Nayanar fervently circumamabulated the deity as a concluding part of the worship, instantaneously he noticed a spider fell on the top of the Linga with a dull sound. 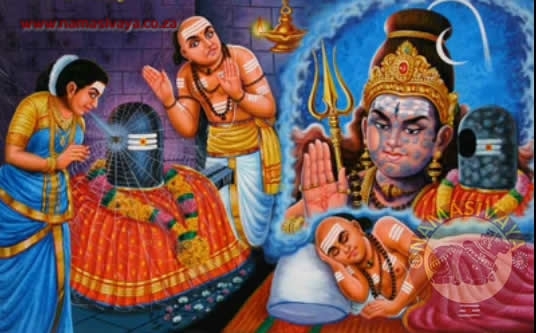 Nayanar’s wife was ready to act; she instantly blew it off from the Linga without distracting Nayanar’s worship of Lord. Nayanar noticed the innocent action of his wife and he was totally traumatized. Though she was acted out of pure love for Lord, he protested her deed as against the sastras and rituals. He contemptuously critized her act as sheer ignorance and the salaiva could have made the Linga impure. He was frustrated left the place leaving his wife in the temple. That night, Nayanar was deeply distraughted and restless. His devoted wife stayed behind temple premise itself, in this way she sincerely followed her husband’s order. The most compassionate Lord appeared before Nayanar in his dream; He revealed the blotches in his body and the discoloration and swelling caused by the spider. He also exposed the other part of his body where Nayanar’s wife blew off the spider was flawless without any blemishes. Nayanar was irrepressible and full of joy; he praised the Lord for His boundless affection. He rushed to the temple at the early dawn, he prostrated before the deity for forgiveness. He brought his wife home and the righteous couple continued their self-less service to Lord. Thiruneelanakka Nayanar had great admiration towards Thiru Gnana Sambandhar. He developed an intense affection towards Sambandhar and wholeheartedly desired to serve the great devotee of Lord. In the meantime, Sambandhar carried out a spiritual tour to Thiruchathamangai and the neighboring places with his fellow devotee Thiruneelakanta Yazhpanar and a group of devotees. Thiruneelanakka Nayanar was elated at the information and enthusiastically made all arrangements to receive the great devotee and his followers. The whole pathways were decorated with flowers, Nayanar singing and praising the glories of Lord received Sambandhar and the entire group. The entire devotees were served by Thiruneelanakka Nayanar and his virtous wife. It was end of the day, Sambandhar instructed Nayanar to provide a safe place for Yazhpanar (he was born in an outcasted family) and his wife. Initially, Thiruneelanaka Nayanar was little hesitant to accommodate them inside the house. Later, Nayanar found a place near arena of sacrificial fire for Yazhpanar and his wife. As soon as the couple entered, the fire from the sacrificial arena lit as its own. Nayanar was astounded to witness this miracle; his mounted egos of caste and creed were crushed instantly. Sambandhar made a visit to the temple of Lord Ayavanthishwarar, he sang praising the glorief of Lord and he also mentioned the supreme qualities of Thiruneelanakka Nayanar in a few beautiful verses. When it was the time for Sambandhar to leave the place Thiruneelanakka Nayanar sincerely desired to accompany the great saint and assist him in his spiritual endeavor. Sambandhar earnestly refused to follow him and instructed Nayanar to carry out his honorable service to Lord and his devotees. Thiruneelanakka Nayanar had the longing to be with Sambandhar grown out of reach. His desires were fulfilled when he was invited to attend the wedding ceremony of Sambandhar. This was the most supreme occasion Thiruneelanakka Nayanar merged in to the brilliance of rays from Lord and attained Salvation. In the Tamil month Vaikasi – Moolam is widely celebrated as Guru Puja Day, the day Thiruneelanakka Nayanar attained the Abode of Lord Siva.